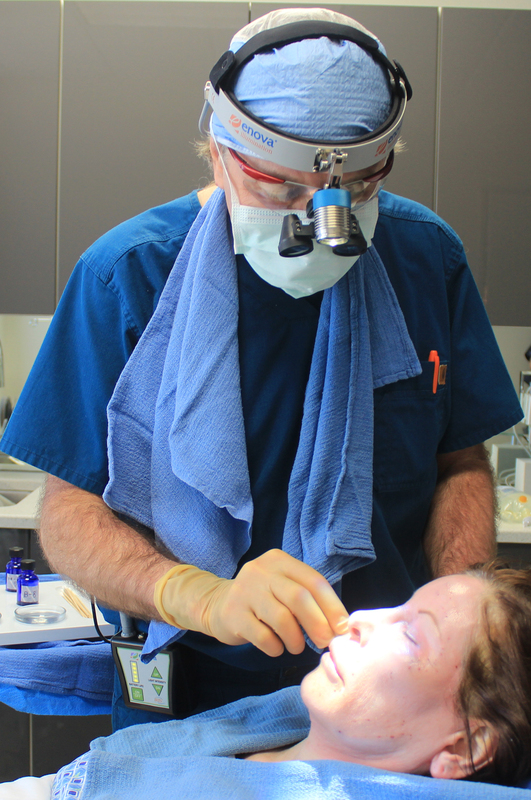 Dr. Richard Bensimon wearing Enova’s XLT-125 as he performs a chemical peel. This month, Dr. Richard Bensimon, a board certified plastic surgeon in Portland, Oregon, talked with Shedding Light about his practice, why he chose Enova LED surgical headlights for his practice, and the legacy passed onto him from his father, who practiced medicine in Argentina. Dr. Bensimon: I’ve been practicing plastic surgery in Portland for 6 years and I have been a plastic surgeon for 27 years. Today my practice is devoted exclusively to cosmetic surgery procedures including facelifts, eyelid surgery, rhinoplasty, and facial skin resurfacing. In addition to facial procedures I also perform abdominoplasty, breast augmentations, breast lifts and reductions, and body contouring procedures such as liposuction. I’ve been fortunate to be working with my long-time Nurse Associate Andrea Stapleton, RN, CPSN. She heads our non-surgical division where we offer facial rejuvenation using Botox, Dysport and wide variety of dermal fillers. Our clinic is recognized for its facial procedures including chemical peels and Ultherapy. Shedding Light: How has your practice changed since 1987? Dr. Bensimon: When I began my practice I performed more reconstructive surgery and over the years I gravitated more to aesthetic surgery. I enjoy the challenge involved in aesthetic surgery and there have been incredible advances in the field such as endoscopic surgery and power assisted liposuction. I’ve also been able to focus on creating a better outcome for cosmetic procedures using chemical peels, which improve texture, wrinkling and skin health. Today our center uses my proprietary BensiPeel™, a chemical peel that provides dramatic results for facial skin resurfacing. It replaces damaged, wrinkled and aged skin with radiant, smoother and healthier skin and can be used alone or combined with surgery. Shedding Light: When did you first hear about medical headlights? Dr. Bensimon: My father—who was also a surgeon—trained with Dr. Ricardo Finochietto in Argentina. In fact, my family is from Argentina and I’m named Richard after Finochietto. Dr. Finochietto designed a general medical headlight at that time called the Fronto Lux and my father always promoted the benefits of the headlight to me during my training. I use my XLT-125 for every surgery I perform except liposuction. The battery life for the Enova headlight is very good. I can be in surgery for six hours or more at one time and the battery has never let me down. I’d love to have a headlight that has a headband as lightweight as a sweatband, but the Enova headlight is pretty comfortable. Dr. Bensimon: Using a medical headlight is part of my family tradition so I’ve always advocated using surgical headlights when performing surgery. Overhead lighting is simply not sufficient enough and I need focused, bright light to work for the detail associated with cosmetic surgery. Shedding Light: How long have you had your XLT-125 headlight and how did you first hear about Enova? 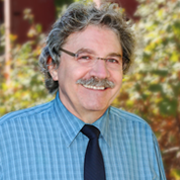 Dr. Bensimon: I’d been using an inexpensive light that was powered by a battery. When I was looking for a better product I saw one of Enova’s ads in Outpatient Surgery Magazine. I purchased two XLT-125 LED headlights and have had them for about two years. Shedding Light: How often do you use your Enova headlight each week? Dr. Bensimon: I use my XLT-125 for every surgery I perform except liposuction. The battery life for the Enova headlight is very good. I can be in surgery for six hours or more at one time and the battery has never let me down. I’d love to have a headlight that has a headband as lightweight as a sweatband, but the Enova headlight is pretty comfortable. Shedding Light: What do you like best about your XLT-125 LED surgical headlight? Dr. Bensimon: I’ve used fiber optic headlights before but didn’t like how they tethered me to the power source. They were also very expensive to maintain. The XLT-125 is reasonably priced and I like how portable it is; it eliminates the hassles associated with moving around the patient. Though I prefer the brightness provided by a Xenon headlight, the XLT-125 is very bright and is certainly perfectly adequate for the procedures I do. Dr. Bensimon: When I’m at the ambulatory surgery center, other surgeons see it and I’ve recommended they try it. The XLT-125 is very useful and has become a part of my surgical routine. Check Out Enova’s YouTube Videos! Great article. I enjoyed reading it!